Red light cameras have become increasingly common at intersections across Long Island. The cameras are part of a public safety program that is meant to change driver behaviors at red light intersections and to encourage drivers to be more aware of the timing of lights and stopping before completing a turn. 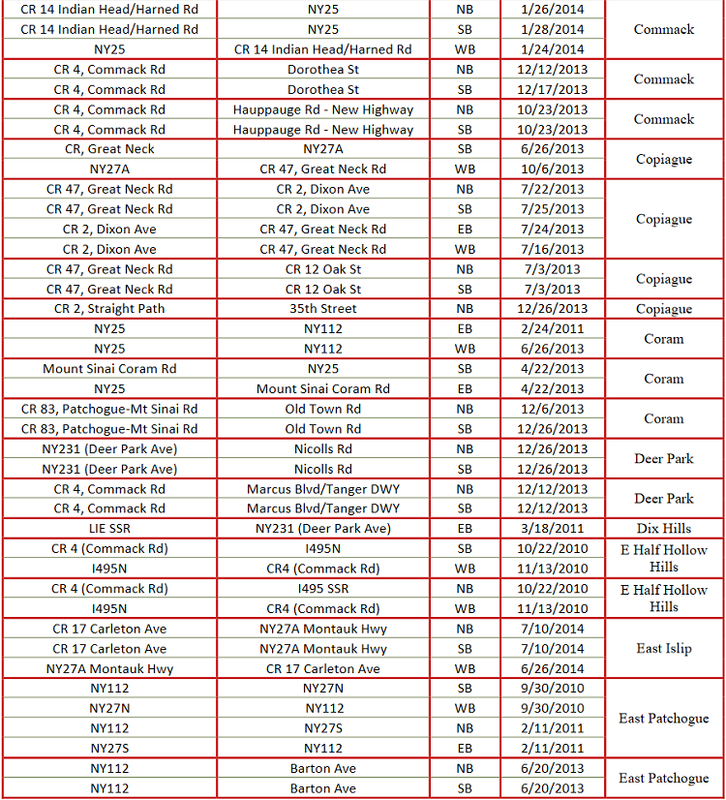 Understand what a red light camera violation entails and know where red light camera locations are on Long Island from this page. More and more drivers have received red light violations as cameras have popped up at more intersections across the Island. Intersections that have cameras are chosen based on an analysis of safety data, including congestion, crash history, and violation data, so that the intersections where drivers are most likely to commit a violation are the ones being watched. The Suffolk County Traffic and Parking Violation Agency says that studies show that red light camera programs are “effective in reducing crashes at intersections, especially right-angle crashes, which cause the most personal injury, and save lives.” According to the Insurance Institute for Highway Safety, red-light running led to as many as 171,000 crashes, 144,000 injuries and 887 fatalities in the United States in 2006. Public costs of these crashes total about $14 million per year. Red-light running at intersections is a problem in Nassau County. The red light camera program aims to change driver behavior to reduce the number of red-light runners and help enforce driver compliance with traffic laws. At Year 5 of the red light camera program, there was a reduction in fatalities (0 fatalities) at all monitored intersections. In both Nassau and Suffolk County, the fine for failing to stop before the line at a red light is $50, and no points are incurred. Offenders in Nassau County must pay an additional $15 administrative fee, and offenders in Suffolk County must pay a $30 administrative fee. A red light violation cannot be pled to a lesser offense, nor can the fine be reduced. Both counties use different websites to host images or video of the offender’s car making the red light violation. To see the images or video related to the incident, offenders who committed a violation in Suffolk County can go to Public Citations and those who committed a violation in Nassau County can go to the Drive Safely in Nassau website. 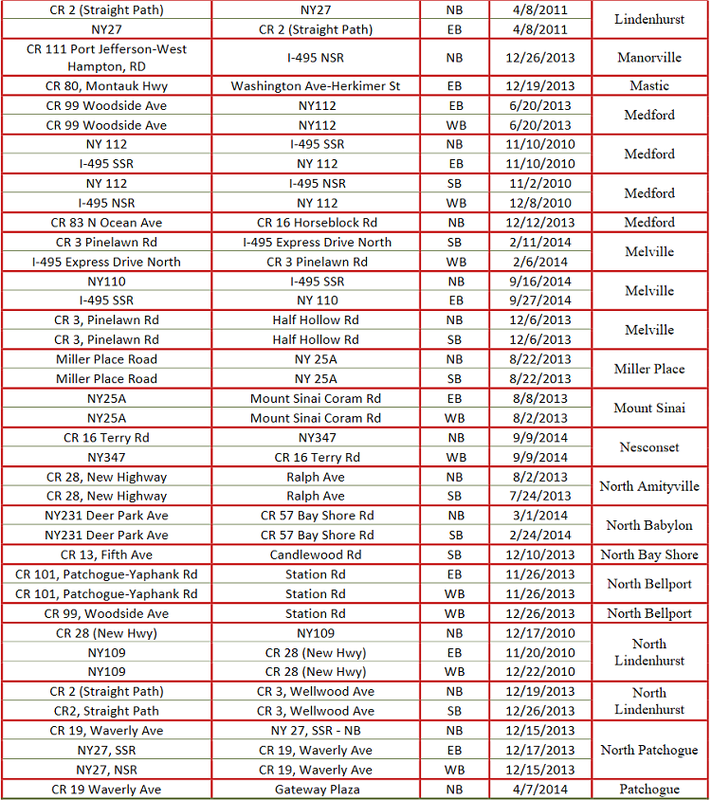 In Suffolk County, red light camera locations at permited at up to 50 intersections under the program. 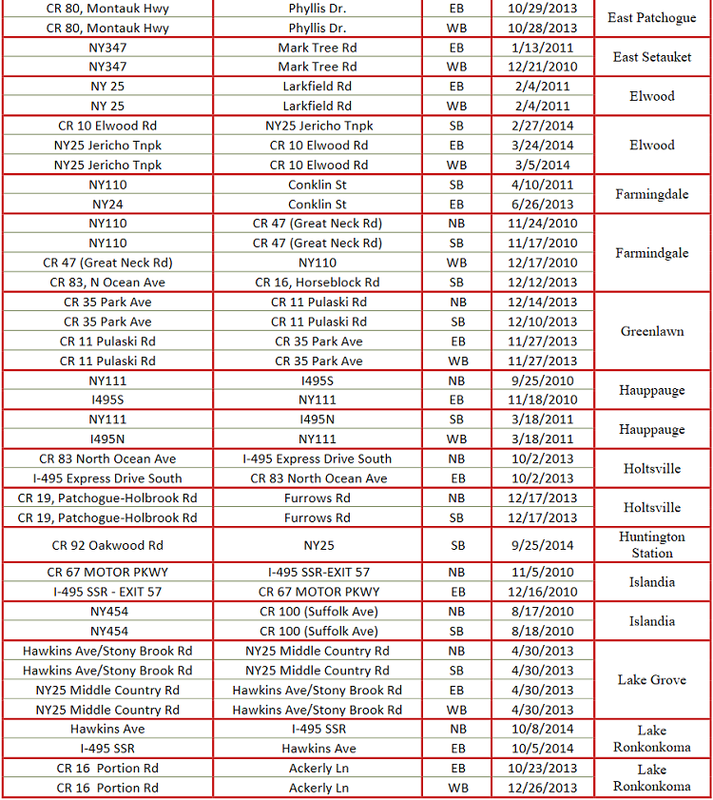 This chart outlines operational red light cameras in Suffok County, as of 2014. 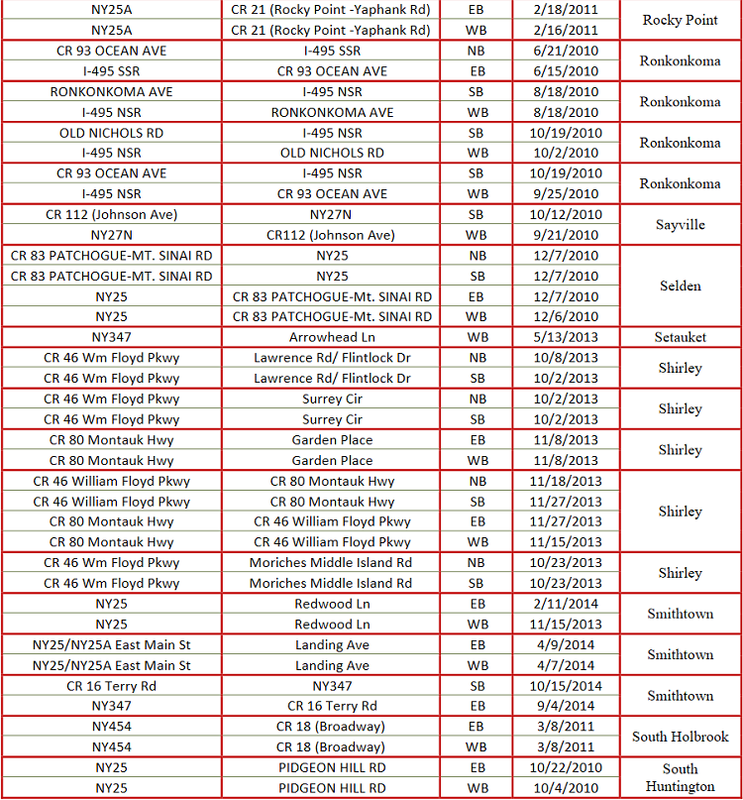 In Nassau County, red light camera location information is no longer publicly disclosed by the Nassau County's Traffic and Parking Violations Agency. Potential locations often include near schools. 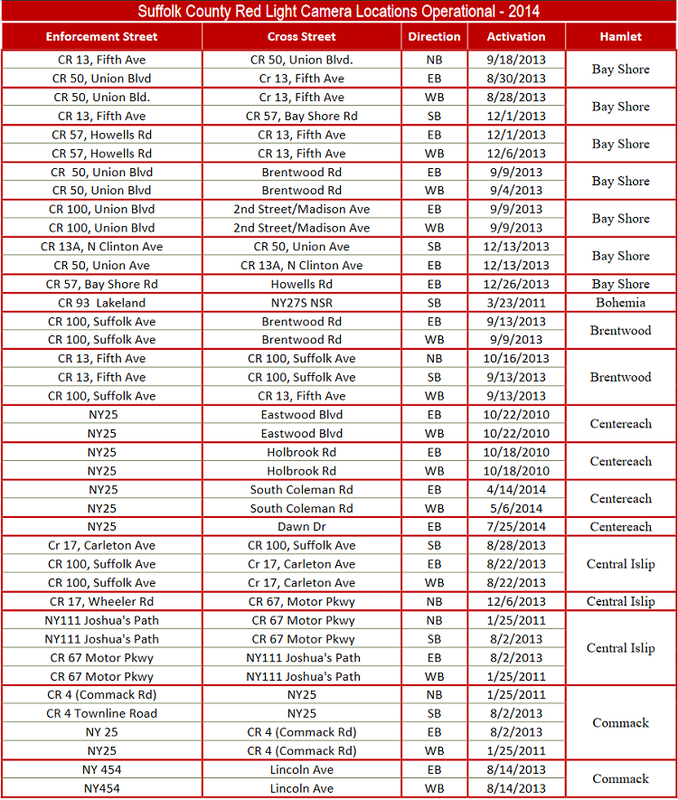 Long Island Traffic - See a map of traffic reports on Long Island, including traffic, accidents, and construction. Long Island Roads - A guide to the major highways in Nassau and Suffolk Counties. Transportation - A collection of every way to get around on Long Island.